Audible, the leading provider of audiobooks with over 180,000 titles. Get your free audiobook at audible.com/twist. Jason’s pick of the week is Smarter Faster Better: The Secrets of Being Productive in Life and Business, written by Charles Duhigg & narrated by Mike Chamberlain. 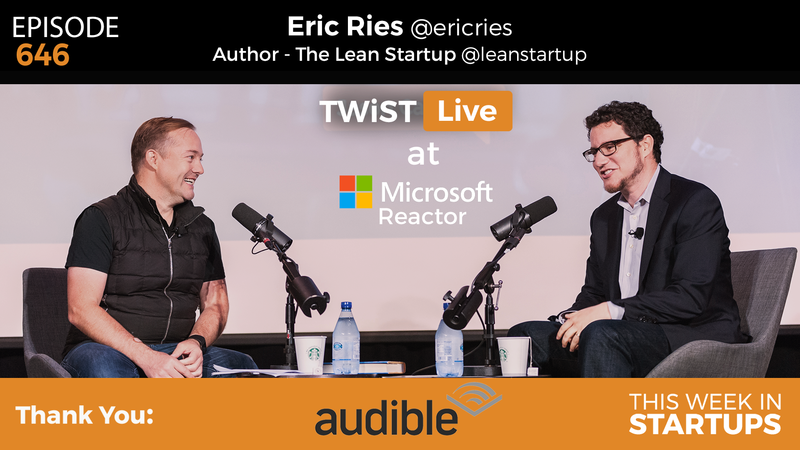 Filmed live at the Microsoft Reactor in San Francisco, Jason takes the stage with seasoned entrepreneur and author of “The Lean Startup,” Eric Ries. Jason and Eric dive right into the meaty processes lined out in the bestselling book. They analyze real examples of the business experiments that Jason has personally tried out using tips and techniques pulled directly from Eric’s scientific method for achieving startup success. Get an inside look at where “The Lean Startup” revolution began. Eric defines a pivot as, “a change in strategy without a change in vision.” Launching new features or changing designs do not count as pivots. Entrepreneurs who are pivoting every couple of days or weeks aren’t truly pivoting either, they just show a lack of focus and vision. Eric has observed that most startups that he meets with can’t pivot, not because of a lack of vision, but because they can’t decide amongst themselves whether or not the current strategy is even working. As a team, you will only know when to pivot if you have had a scientific, consistent dashboard of facts and data collection that has remained constant since the beginning. Eric has taken a whole new approach to publishing “The Leader’s Guide,” the follow-up to “The Lean Startup.” It was important to him from the beginning that he make the book a minimum viable product. The idea was to create a Kickstarter campaign for this book in order to support the next traditionally published book. He wanted “The Leader’s Guide” to only be sold to those who supported the campaign, allow those select readers to test the ideas in the book, and then write the next book based on the info gathered from that experiment. His publishers had a difficult time understanding why he would want to limit the number of copies sold, but they ultimately negotiated a deal. Eric gives a thoughtful example on why you need to put your ego aside and stop trying to read your customers’ minds. He was working with a startup that was charging, let’s say, $25 for their commercial product. They were absolutely sure that their price point was perfect. Eric wanted to run an experiment where they upped their price from $25 to $150, just to see what the customer reaction would be. To their bewilderment, they found that their customers still were willing to pay, even at a 6x price hike, without any decrease in user base. This is an idea that Eric spoke about on c-span awhile back. The proposal that he made was to change the way we insure employees who have been involuntarily laid off. He believes that displaced employees should have the option to convert their unemployment payments into a small business loan for starting a company. Instead of giving out money, the government would be taking that money and creating job creators. The program would include business classes, incubators, etc. all in a movement to turn unemployment into entrepreneurship. 3:58-7:17: The decision to pivot is always a difficult and emotional experience. The scientific approach will help take the emotion out of the equation. 7:12-11:11: Eric warns not to compare yourself to the god-like kings of tech (i.e. Steve Jobs & Bill Gates). 14:39-19:13: The two discuss their personal approaches to responding to jaded fans. 19:13-23:41: Jason asks for feedback after explaining his own experiment that he ran using Eric’s lean strategy. 23:41-26:52: What’s the best approach when you get resistance from your team on running a particular experiment? 32:05-33:38: Jason exposes his dissatisfaction with Daniel Craig for turning down the role to play James Bond in the next film. 33:38-39:24: Jason shares another revenue experiment that he tried. Eric shares his concern on vanity metrics. 44:39-48:37: Jason turns the discussion to pick Eric’s brain on the tech industry in general. 48:37-52:57: Eric explains his admiration for the strategy board game, Go. 52:57-54:25: The duo discusses the fact that we must be on the verge of something big with AI. 54:25-57:34: Jason changes the discussion to the geopolitical “big picture,” on the impact of acceleration technological innovation. 57:34-1:04:15: Eric explains his proposal of a pro-entrepreneurship public policy. 1:04:15-1:07:49: Eric argues for the genius in the American political system, yet admits that there are major downsides at the same time. 1:12:37-1:14:55: Eric talks about the need for the American people to have a political reckoning, and to hold those who support a destructive system accountable. 1:14:55-1:18:09: Jason asks Eric what the chances are that Trump wins. 1:18:09-1:22:44: The two share an optimistic disposition for the future of humanity.